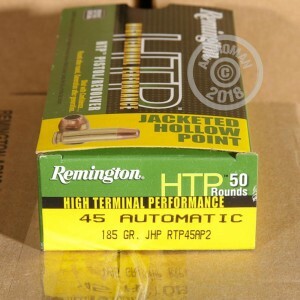 If you're looking to get more reliable penetration out of the .45 ACP while still taking advantage of its high caliber, this affordable self-defense load from Remington's HTP series might be for you. These cartridges fire a light 185 grain jacketed hollow point bullet that achieves a muzzle velocity of 1,000 feet per second while retaining a relatively high mass and, of course, the .45 caliber. This combination makes for good penetration backed up by strong expansion and results in impressive terminal performance. 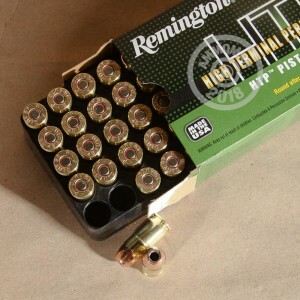 These .45 Auto rounds come in an economical 500 round case, with 10 boxes of 50 rounds each. 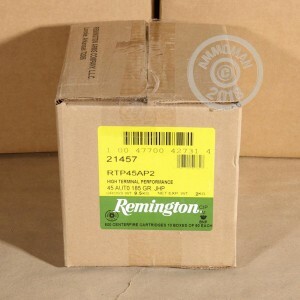 Like other Remington ammo, they are manufactured in Arkansas using non-corrosive Boxer primers and brass cases. Grab your case today to take advantage of free shipping at AmmoMan.com. This Ammo shoots great and is very clean with lower recoil than 230 grain, but very high speed-flat trajectory and accurate. Follow up shots also very accurate due to reduced recoil. If my life depended on .45 Ammo-it would be this Ammo. These are great for recoil on a .45 and flat shooting accuracy. I use them at the range when I want really small handgun groups and also carry them for defense. The Ammo was too knotch and the price was great! This Ammo is hard to find and very accurate for .45 defense ammo.